Gwynedd Shipping has recruited Matthew Farrall as its new general manager at its Deeside depot. 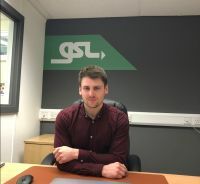 A first class honours degree in Logistics and Supply Chain Management from the University of Huddersfield he has worked for Hellman Worldwide , Palletforce, Hoyer and Clipper Logistics. He will take charge of the growth and management of Gwynedd’s pallet network, warehousing and general haulage operations across the UK, reporting to managing director, Andrew Kinsella.